This 9.6 cu. 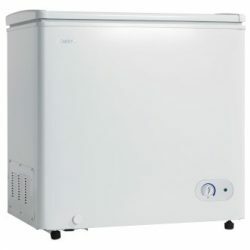 ft. capacity chest freezer uses an environmentally friendly R600a refrigerant and is Energy Star® rated. Complete with a compartment divider in the adjustable wire baskets, this freezer is a perfect to organize and store any of your freezer goods.